If you want your home to remain reasonably true and livable for a long time, a good foundation is critical. There are many choices a foundation types, and of materials to use, when building your home. They will depend on whether you want a basement for a living space, or there are special challenges posed by location, and the soil conditions of your building site. You should have a good idea of soil conditions before deciding on a foundation type. An ideal situation, is one where the foundation can rest directly on bedrock, but this is seldom possible. It is more common that a house must be “floated” on soil of various degrees of firmness, sometimes on the same site. A foundation should never rest directly on loam, peat or other topsoil, and you should try to avoid disturbed soil of any type. Undisturbed clay or gravel usually form a good base, but there may be special considerations. Some clay, bentonite as an example, will swell when it becomes wet, and can raise havoc with floors and footings resting on it. Care must be taken to provide a consistent moisture level, or to remove layers of this type of material. Other soils may have chemical properties that will attack and degrade concrete, or other foundation building material. A soil test may be of value, but a good practice is to see what problems have arisen with the foundations of older homes in the area. Problems may take 30 years or more to show up, but we would expect a lifespan of a house to be 100 to 200 years or more. Building on a concrete slab is a simple method, and is often used for garages and outbuildings. A well reinforced slab will float on unstable ground, but can be affected by frost heaving or hydraulic forces. Some building codes may impose strict conditions or an engineers approval in its use for a dwelling, unless there is a perimeter footing below frost level to solid ground. Usually a thickened area with extra reinforcing bar will be required around the outside perimeter. In cold climates, a rigid insulation will be required around the outside and extending outwards just a little below the surface to slow frost penetration. Walls come in close proximity to the ground with this method. Treated bottom plates should be used and the outside sheathing should be treated for at least a foot (31cm) above ground level. Wastewater plumbing the water entrance will need to be roughed in right after the excavation. Changes to plans or errors will be difficult to fix after the pour so be exact. You will need a layer of at least 4 inches of clean aggregate for drainage under the concrete floor. You may want to install heating or ducting in the floor. Radiant hot water heat is a good choice but in cool climate insulation under the floor would be the minimum for comfort. Modern codes are concerned with radon gas. A 6 mil polyethylene film will probably be required under slab. This is also a good idea to prevent moisture penetration and resulting surface problems. A method to monitor or remediate underfloor radon levels may be required. Usually no more than a 3 or 4 inch pipe in the underfloor aggregate extending from the approximate center of the building and up through the floor in some inconspicuous location. Be careful that it does not become plugged with concrete. This will be required for any slab in a dwelling. One big advantage of a slab on grade is the reduction of steps for entryways. A crawl space Created when foundation walls are extended below frost level but not sufficiently deep for a basement. It leaves room for mechanical installations and may provide some storage. It may be a conditioned space (heated or cooled) or not. If unconditioned, then insulation and air barriers must be provided in the floor of the house. Crawl spaces are usually conditioned in cold climates, and the foundation should include insulation and air barriers. A vapor barrier should be placed on exposed earth, but should not be sealed, as it should allow for water to drain. One method I have seen used, is to place house wrap exterior side down over the soil. I cannot attest to it’s effectiveness, but it does seem to make sense. A basement is is only a crawl space extended up or down. 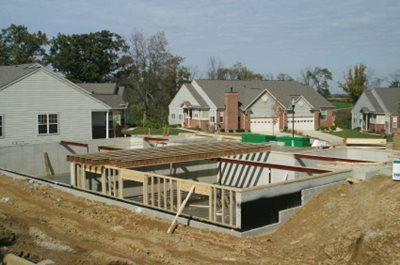 basements are usually between 3 and 8 feet in the ground, and with 8 to 10 foot (2.44 to 3.05 meter) foundation walls. Foundation walls may be of one material or a combination. They may be floored with a concrete slab (most common) or a framed wood floor. Any portion of a wood floor within 1 foot of the earth, or otherwise subject to wet conditions, must be of treated wood. Basements are commonly finished to provide extra living space, and as such should have sufficient headroom. This may require 9 or 10 foot foundation walls to accommodate ducting or sound proofing. All types of foundation require a footing of some kind, except in the case of friction pilings. A friction piling is either driven into the ground until it meets sufficient resistance, is set in concrete, or is a reinforced concrete pile poured directly into a hole, and relying at least partially on the contact with the sides of the hole to provide stability. The friction piling may not be appropriate where freeze thaw cycles could be a problem. A footing is either a continuous lineal pad under the foundation, or a round or square pad under a piling or post. The purpose is to spread the weight over a wider area of the soil. Think of a snowshoe. A pad of reinforced concrete 8 inches (20 cm) deep and 16 inches (41 cm) wide, or in circumference, is normally sufficient. If soil conditions are bad, or if posts are far apart, then a wider footing can be used. Extra reinforcing and thickness may be needed. Sometimes a footing of treated wood placed on clean gravel may be used. There are several types of foundation wall, but all should be firmly secured to the footing. Horizontal forces from back fill and hydraulic pressures are the major concern. A concrete wall without reinforcing 8 inches or more in thickness has been the norm for many years, although there is no reason it cannot be reinforced, if in an earthquake prone area. Reinforcing should be added above all openings. In some old homes, large stones were added, to save on concrete. This was a poor practice, as it could weaken the structure. Concrete network.com is a good info source for all kinds of concrete work. Although considerably weaker, foundations are often built of masonry blocks, bricks or stone. Solid concrete pillars are often added at intervals to increase strength. PWF (preserved wood foundations) are becoming more common. Codes may require an engineers approval. The lifespan of these may be about the same as concrete, in many conditions. They are popular where concrete is difficult, costly to obtain, or experienced concrete workers are unavailable at a reasonable price. The basement and main floor must be installed before back filling. Extra care needs to be taken, to provide base drainage and back sloping, in order to reduce hydraulic pressures. This type of construction is easy to insulate and finish, as it is nearly identical to upstairs wood framing. This is not a good choice on steeply sloping sites, as the ability to resist uneven lateral forces is not good. A recent innovation is the use of Styrofoam blocks filled with reinforced concrete. The blocks are usually two pieces of 2 ft. by 4 ft. Styrofoam 2.5 inches thick, held about 6.5 inches apart by plastic ties and have embedded plastic strips, for nailing and screwing. They can comprise the entire exterior wall system of the house. Although material may be costlier, construction is fast and simple, and does not require skilled labor. No further insulation or air barrier is needed, and finishing material can be attached directly. Sound proofing is excellent. About 20 percent less concrete is used than in a conventional concrete wall, so this method may be more environment friendly. A concrete pumping truck will probably be required, so availability and cost is a factor. The walls will be thicker, adding an element of difficulty in finishing. I have used all these types of foundation in certain circumstances, and seen them used in many more, and I do not have a favorite. Cost and conditions are the determining factors. I like PWF wood for remote locations. Concrete or posts work best on steep sites. Styrofoam block is good when labor is at a premium. Posts are convenient for farm buildings, cabins, and some difficult sites. I find block, brick or stone fine for low foundation walls. A good understanding is a good foundation to build on. This entry was posted in Uncategorized and tagged bearing wall, concrete, crawl space, footing, foundation, frost wall, piling, PWF, slab on February 19, 2013 by Rick.